Christina Liu uses toys to help kids with or at risk for developmental delay reach their full potential. Her goal is to educate parents on how children develop and to sensitize them to the uniqueness and individuality of their child. Here she shares her opinions about some of the toys that came TDmonthly Magazine’s way, rating them on a scale of 1 to 5 TDs (for TDmonthly! ), with 5 being the highest score. This month, her kids chomp on bubbles, learn what makes each other tick, find various ways of learning Spanish, and more. Thumball is a soft, colorful ball with a simple concept: Throw the ball, catch it, look under your thumb, and respond to the cue. There are a variety of Thumballs, such as Letter Mania and Category Mania, and designs for everyone from young children to adults. 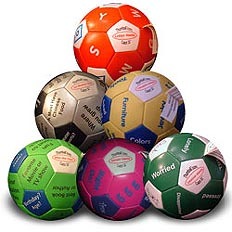 This unique ball adds extra challenge to the eye-hand coordination and gross-motor skills usually associated with ball catching. By encouraging children to think of words that begin with a certain letter, or to name examples that fall under a specific category, Thumball increases their vocabulary and improves their quick-thinking ability. It’s also a great ice-breaker and conversation starter. The concept behind Thumball is simple, yet it strikes at several learning areas. The games are fun and children learn. The children enjoyed throwing the ball to each other and anticipating each others’ answers. They especially liked the Category Mania ball, because it reveals more about the interests of their peers. Speed Limit is a math card game in which the goal is to have a pile of cards with a total of less than 100. Each player takes a turn placing a card down and stating its value. “Transportation” cards increase the value, “hazard” cards decrease the value, directional cards skip a player or reverse the direction, some cards maintain the value, and others automatically speed it up to a value of 50 or 100. The cards are colorful and durable. This game encourages math skills because children are required to add and subtract. It also requires that they follow directions. Children are taught different modes of transportation such as boat, horse, rocket and school bus; the manufacturer states that the cards can be used to help ESL students, too. This is a fun and interactive way for children to develop their math skills. The children realized that they had to really pay attention, because if they didn’t hear what the other player said, they wouldn’t know what the total was at their turn … unless they got lucky and didn’t get a “transportation” or “hazard” card. This four-in-one card set allows children to play Rummy, Go Fish, Crazy 8s and Snap while learning about sea animals and Spanish. 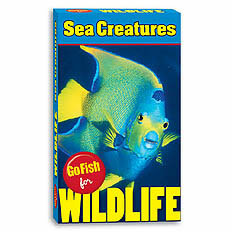 Each card has a photograph of a sea animal and features its name in English and Spanish. There are nine fascinating categories of these animals, such as night feeders and headless creatures. With four games in one, children learn a variety of skills, from matching and sequencing to developing their reflexes and hand-eye coordination. Children also discover the many beautiful creations in the sea while learning their English and Spanish names. The photographs are absolutely beautiful. The cards also come with interesting facts and a pronunciation key for the Spanish names. I had the children pronounce the names in both English and Spanish when they put their cards down during play. Now children can have a laptop of their own without parents worrying about theirs. The Multi-Laptop is filled with 18 fun learning activities, from math to music, in both English and Spanish. It’s shaped just like a laptop and features a QWERTY keyboard, so children will feel like adults hard at work. The varied activities promote learning on several different levels. 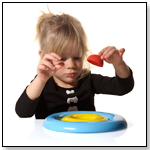 Children develop their vocabulary and hand-eye coordination, and are able to work on addition and subtraction, memorization, following directions and musical ability. They can also learn another language. 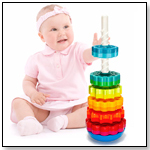 With so many games in one toy, kids will never be bored, and parents will be happy because their children are learning. The screen is small and the laptop is not that durable, but it’s affordable considering all of its features. The Bubble Countin’ Chompers are adorable and colorful animals that “eat” bubbles and count to 50. As the child squeezes the handle, the Chomper opens its mouth and says a number or a funny line, laughs or burps. It comes with a bottle of bubble solution and a bubble wand. Children are able to develop fine motor skills by squeezing the handle, and they strengthen hand-eye coordination as they try to catch a bubble in the Chomper’s mouth. They also learn numbers up to 50. Children love bubbles. Many children crack up laughing when I pretend to eat bubbles, so I knew they would love this toy. They had a great time running around catching the bubbles.